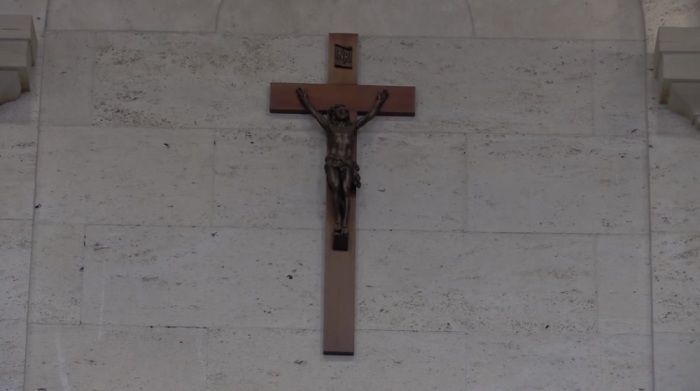 A crucifix that has been affixed to the wall in city council chambers in Montreal, Quebec, for over 80 years will be taken down to "reaffirm" the “secular character” of the government building. The crucifix, which features a sculpture of Jesus, has hung on the wall of the Montreal City Council since 1937. It was originally stationed there as a reminder to politicians to ensure their decisions are guided by God. But when the building begins a three-year renovation next month, the crucifix will come down and won’t be put back up, according to the person overseeing the renovation. That person is city councilman Laurence Lavigne-Lalonde, who made the announcement last week during an executive council meeting. “The crucifix was installed during an era that was completely different than the one we live in today,” Lavigne-Lalonde said during the meeting, according to CTV News Montreal. While the crucifix won't be going back on display at its original location, it's expected to be on display in a museum area in Montreal’s renovated city hall in 2022. CBC reports that another crucifix on display at the Peter McGill Room at Montreal’s City Hall will also be removed. Mayor Valerie Plante argued that the cross doesn’t need to be located in a “secular institution” such as city council. “[F]or me, there is a stark distinction between individual and institutional secularism," Plante stressed. As Quebec is an area known for its Catholic heritage, the Roman Catholic Archdiocese of Montreal responded to the news by calling the crucifix symbolic of the city's roots and "a love for all humanity." "Nothing forbids us, and our respective beliefs, from being present in the public space in an attitude of respect and openness, since we share the same common humanity," a spokesperson told CBC. The planned removal of the crucifix from the Montreal City Council comes as there has been much debate about whether a crucifix hanging over the speaker’s chair at the National Assembly of Quebec in Quebec City should be removed. The crucifix was installed in the Blue Room of the building in 1936. But a government-commissioned report in 2008 recommended that the cross be removed. Premier François Legault had argued that the cross would stay because it is a historic symbol rather than a religious one. But last week, Legault hinted that the removal of the crucifix is being discussed as a potential part of a secularism bill to be introduced by the controlling Coalition Avenir Quebec Party.